Love is in the air, on the slopes and on the dance floor. Morgan, Amy, Carlie, and Emily, the Girls of Harbor View, must uncover the secrets of guys, friendship, and what really matters. Ski Trip: The long-awaited ski trip finally arrives, but events take a downturn when some of the girls go completely boy crazy. Carlie, however, won't have anything to do with the boys-or her flirtatious friends. Instead, she gets crazy-dangerous while snowboarding. What will it take to bring the girls to their senses? 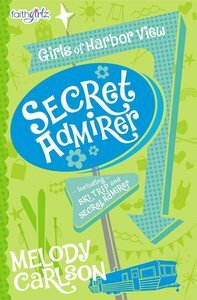 Secret Admirer: As Valentine's Day approaches, Amy finds herself pursued by a secret admirer, and she mistakenly sets her heart on the wrong guy. When news gets out, Amy is devastated and humiliated, until she concocts a plan to transform the day. About "Secret Admirer & Ski Trip (#04 in Faithgirlz! Girls Of Harbor View Series)"
Meet Morgan, Amy, Carlie, and Emily - four girls who all live in the trailer park at 622 Harbor View in the tiny town of Boscoe Bay. Being neighbours has made them friends, but a desire to make their world a better place - and a willingness to work at it - is what keeps them together. Ages 9+.